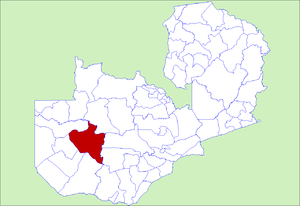 Kaoma District with headquarters at Kaoma, Zambia is located in the north-east corner of Western Province. As of the 2000 Zambian Census, the district had a population of 162,568 people.The population lives mainly around Kaoma town and the northern parts of the district along the Luena and Luampa Rivers. Its south-western portion is relatively uninhabited being very sandy with little water available in the dry season. This page was last edited on 15 July 2016, at 12:04.